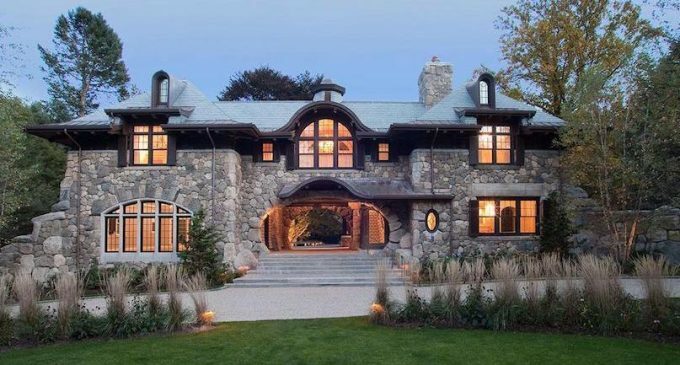 A 50 foot beech tree served as the focal point of this whimsical stone and shingle home in Brookline, Massachusetts. There is more than 6,300 square feet of space, designed in an L-shape, with a majority of the living spaces opening to a courtyard deck around the historic tree. Homeowner’s David and Stephanie D’Angelo told New England Home that the tree was an important piece of the project, “The house and the patio sort of wrap around the tree and the effect is pretty special.” The home was designed by Boston based architectural firm Meyer & Meyer and masterfully built by Sanford Custom Builders Inc. in 2015. The exterior architecture was inspired by the works of architect H.H. Richardson, while interior designer Maureen Griffin Balsbaugh kept the interiors bright, welcoming and sophisticated. The result is a wonderfully unique residence ready for family life. Property records reveal that a 6,600 square foot 1950s residence previously stood on the 1.37 acre property. The 13 room residence had five bedrooms and six bathrooms. Photography by Michael Partenio and Damianos Photography.